This was Kyler's (my son) first Halloween! He was nearing 9 months old when his costume was created. Kyler loves books and so naturally a bookworm was fitting for his costume. We also wanted Kyler's wagon to be a part of his costume. My husband created the books that cover the wagon out of cardboard boxes and scrap pieces of cardboard. We spray painted the cardboard and then printed, cut, and glued letters on the cardboard to create the book titles. 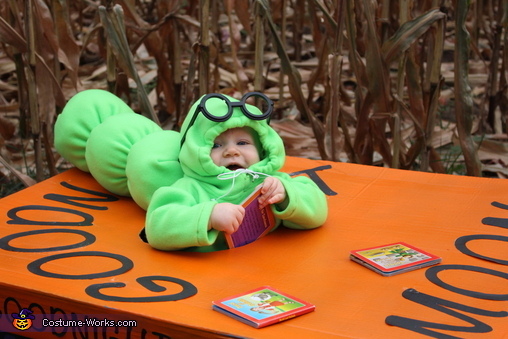 My mother-in-law used fleece fabric and sewed his bookworm costume. I asked her to make it in two separate pieces. The back end of the bookworm (bubble-looking piece) was stuffed with polyfill and can detach from the sweatshirt part of the costume. We used velcro to attach the two pieces together. The glasses would not stay on his face very well, so we used hot glue to glue them to the top of his hood. We placed a Bumbo seat on the inside of the wagon to help him sit higher and prevent him from moving around too much. Small books were placed around Kyler to add to the costume but also helped to keep him entertained. The only item we had to purchase was the fabric, which cost around $5. Everything else we had on hand. The costume took around 7 hours to make. Everyone loved his costume so much! Strolling around town and hearing all of the positive comments about his costume was a lot fun.